Sarah is notoriously independent and flouts societal norms and expectations. At the same time, she reveals herself to be a hena, i.e., a verysweet,beautiful girl, whose interactions with strangersevoke a smile and trust getting them talking. 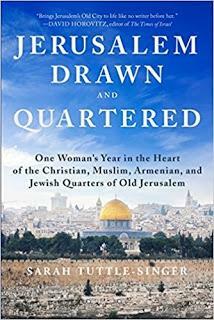 She tells about her conversations with the Palestinian taxi driver boyfriend of a Jewish Israeli, and the ultra-Orthodox wife and mother starving for affection. The cold stone Old City can appear rough and raw, butbelievers and the faithful can touch the indentation in one wall “left by Jesus Himself when he stumbled and almost fell.” When Sarah touches the cold Jerusalem stone, she feels warmth from the spot.